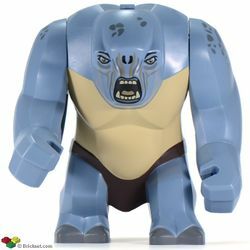 The Cave Troll is a big figure from the theme The Lord of the Rings released in May 2012. It appeared in LEGO The Lord of the Rings: The Video Game and physically in 9473 The Mines of Moria, to which it is exclusive. The Cave Troll is mainly Sand Blue and Tan. It is made up five pieces: One large body, head and legs piece, two arm pieces and two hand parts. The body is very large and is hunched over, with a wide, sand blue back speckled with grey and a head jutting forward, parallel to the ground. Two studs are located just above the head, in between the shoulders. The face is rather flat and has printing of small, beady eyes with two nostrils in between them and a an open, roaring mouth. It has printing of a tongue and bared teeth on it. Several wrinkles line the mouth, eyes and nose. The chest and stomach are both tan with no printing. The troll has a brown loincloth that encircles the waistline. It has two stubby legs that sport a pair of large grey toenails each when the book depicts them as having no toes. The arm pieces are sand blue with grey speckles at the shoulder areas. They are large and slightly bent at the elbow. At the shoulder, they can connect to the body and at the wrist they can connect to the hands, which are claw-like and depict three thick, stubby fingers. Due to the angle of the fingers, the hands can grip rods that are minifigure-scale. Cave Trolls could grow up to between 11–19 feet tall and grow in a hunched-over way, with their head jutting out. Their natural habitats were caves, as they had a natural weakness to sunlight. If exposed to it directly, they would be turned to stone. Cave Trolls were wild and unintelligent creatures by nature, traveling around in small groups of two or three. They could be manipulated and tamed to a degree however, as shown when the Orcs of Moria used one in an attack. The Cave Troll's skin was incredibly thick, providing dermal armor strong enough to withstand swords and spears. While the Fellowship were in Moria, they encountered a Cave Troll being led on by a goblin tamer. The Cave Troll proved to be a devastating opponent, managing to smash through multiple stone columns within Balin's tomb, and even stabbing Frodo Baggins with a spear, who was saved only by the Dwarven Mithril chainmail he wore underneath his clothing. Eventually the troll was killed by Legolas, who shot it in the head and neck with multiple arrows. A huge and brutish simple-minded creature that lives in the Mines of Moria. The Cave-troll is 2-3 times taller than men. Surprisingly fast for a creature of that size. It keeps away from the rest of the world, hidden in the constant darkness of the Mines of Moria. Its eye sight is very poor, so it uses its sense of smell to find its way in the dark. It does not know good from evil and will attack anything that wanders into its lair. Note: cannot be defeated by a frying pan. A huge and brutish simple-minded creature that lives in the Mines of Moria. The Cave-troll is 2-3 times taller than men. Surprisingly fast for a creature of that size. It keeps away from the rest of the world, hidden in the constant darkness of the Mines of Moria. Its eye sight is very poor, so it uses its sense of smell to find its way in the dark. It does not know good from evil and will attack anything that wanders into its lair. Note: cannot be defeated by a frying pan. This page was last edited on 12 January 2016, at 22:26.